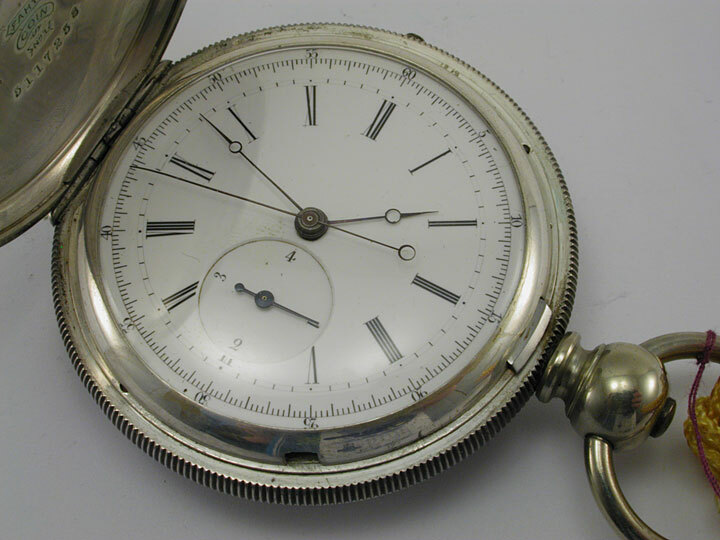 notes Gentleman's, key wound, key set, two train, diablotine (quarter jump seconds), chronograph hunting case pocket watch in a coin silver Fahys American case, No Serial Number on movement which was made by and is marked for Jules Jurgensen, Copenhagen, Denmark (and Le Locle, Switzerland), circa 1870s. 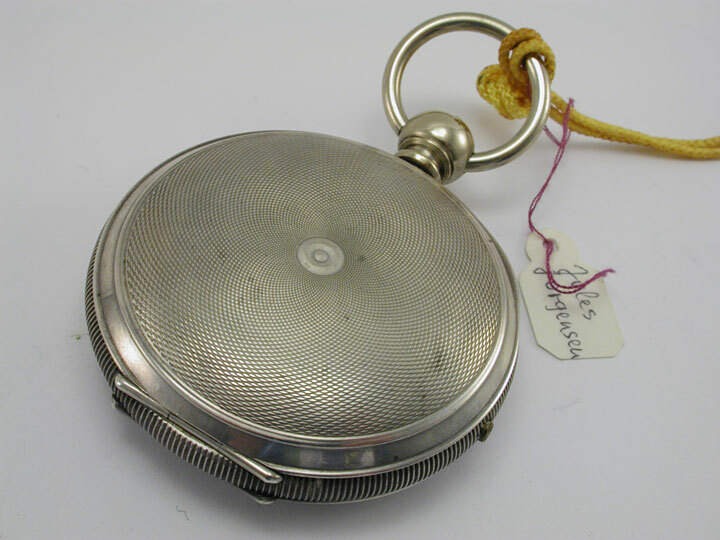 46mm diameter, four leaf, coin silver, engine turned hunting case with fluted case edges and hinged cover in the savonette style with the push button pendant and bow placed at the three position. 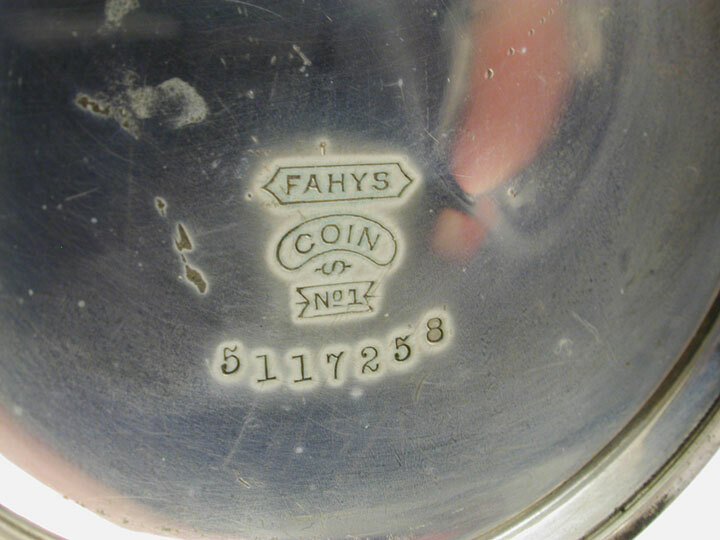 On the inside of the cover the name "Fahys, #1 coin" (silver) watch case number "5117258", indicates the watch was likely recased in America, (likely because most of these pocket watches were originally made in solid gold). This case was made by the Fahys Watch Case Company (See notes) The damascened cuvette has three winding apertures including two for the double train. 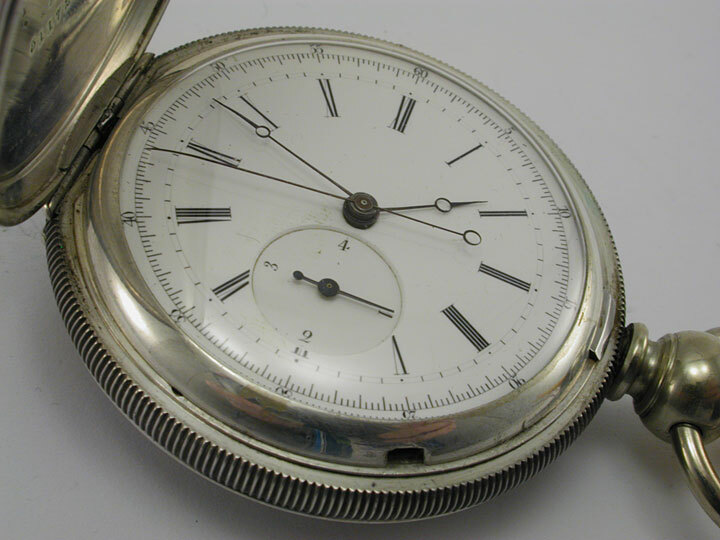 White enamel dial with Roman hours, closed minute track to the outside and seconds track divided into fifths of a second with Arabic markers placed every five seconds, Breguet steel hands and counterbalanced chronograph sweep seconds steel pointer, along with a subsidiary dial @6 with jumping quarter seconds (marked 1-4). The dial is unsigned. 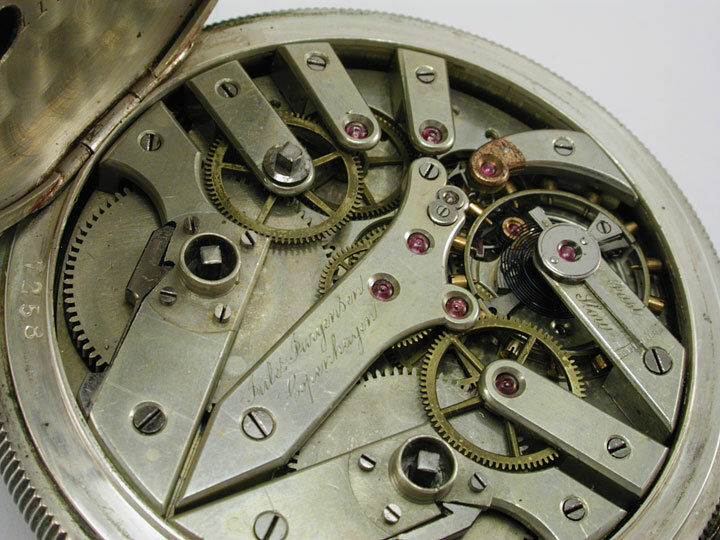 This is a 21 ligne, 25 jewel, nickel finger bridge movement with two trains, having two barrels and one escape wheel. The extra barrel and train furnishes the power for the sweep seconds arrangement. 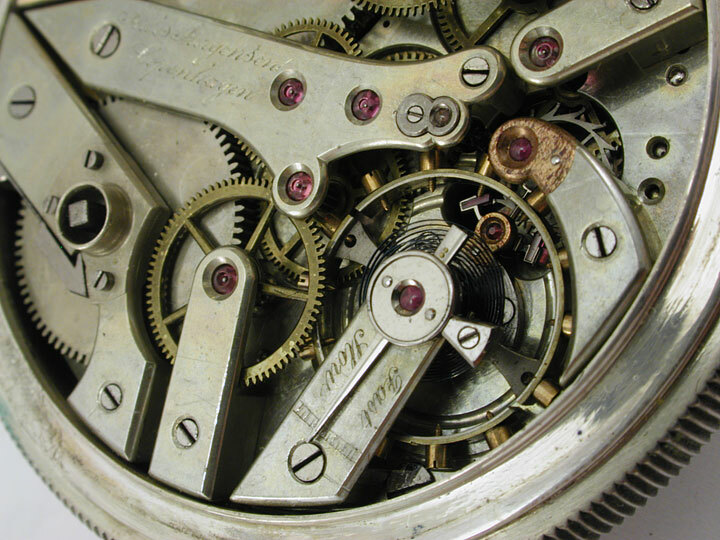 This movement has a pivoted detent escapement (controlled by a coiled spring similar to a balance spring as opposed to a Spring detent which uses a long spring) with jeweled pallets, bi-metallic compensated balance wheel with gold timing screws. The movement is signed on the central bifurcated bridge, "Jules Jurgensen, Copenhagen" with no evidence of a serial number. The dial and movement are unsigned. The case is coin silver made by Fahys in America. Scuffing of the dial in spots but no fractures and general in average- good condition. Oxidative changes to the coin silver case. no serial number on the movement. movement appears to be correct. Assume the watch can function with cleaning. In a solid gold original case usually the cuvette is signed Jules Jurgensen and such a watch (without repetitions) would likely bring about $5000+/- on the auction market today. Another problem is that replicas of this Jurgensen rare type two train movement are known. I am assuming that this is genuine example with only the case having been changed from the original. Joseph Fahys came to America in 1848, took his training in Hoboken, N.J. and set up shop on Nassau Street in New York City in the year 1857. He opened a second case shop in Carlstadt, New Jersey in 1861. In 1882 he merged it with a large factory he had built in Sag Harbor, N.Y.
Fahys generally made watch cases of either silver, gold filled or nickel cases. However, some time between 1865 and 1890 he formed the Brooklyn Watch Case company for making solid gold watches.